How much do you know about Nordic countries and international law? 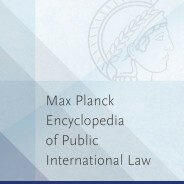 The Max Planck Encyclopedia of Public International Law (MPEPIL) is a comprehensive online resource containing peer-reviewed articles on every aspect of public international law. Written and edited by an incomparable team of over 800 scholars and practitioners, published in partnership with the Max Planck Institute for Comparative Public Law and International Law, and updated throughout the year, this major reference work is essential for anyone researching or teaching international law. Which Nordic state had sovereignty over Iceland until 1918? Which state was allowed to discriminate against a transgender woman by annulling her marriage? Who disputed ownership of Eastern Greenland before the Permanent Court of International Justice? Which Nordic state has been the subject of the most UN human rights complaints? In preparation for the European Society of International Law’s 11th annual conference, this year held in Oslo, test your knowledge of Nordic countries in international law with our quiz.